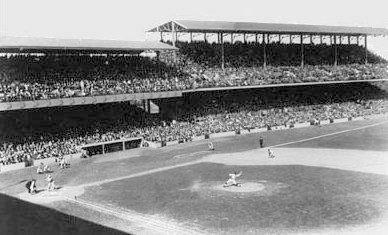 It’s Opening Day in the nations capital as the Washington Senators are at home at Griffith Stadium. Here is where you will see one of the best Opening Day traditions in baseball from 1911 until 1961 as the President of the United States may be in attendance to throw out the ceremonial first pitch. Professional baseball in Washington, DC dates back to the 1870s when baseball was played at ballparks known as Swampoodle Grounds, Athletic Park and Capitol Grounds. 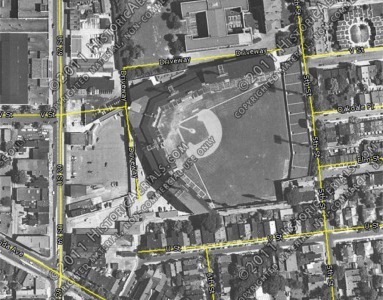 In 1891 a plot of land at the intersection of Georgia and Florida Avenues became the home of the Washington Senators baseball club, a member of the American Association and National League from 1892-1899. 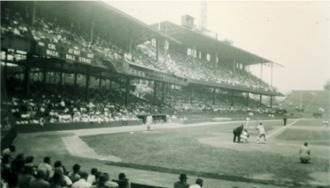 The 6,500 seat ballpark was known as Boundary Park and National Park. After the 1899 season the Washington baseball team was contracted, but two years later, the Western League’s Kansas City franchise moved to Washington, DC and became charter members of the American League. The American League Washington Senators made their debut in on April 29, 1901 at American League Park. Two seasons later they moved to National Park, which was renamed American League Baseball Park II. 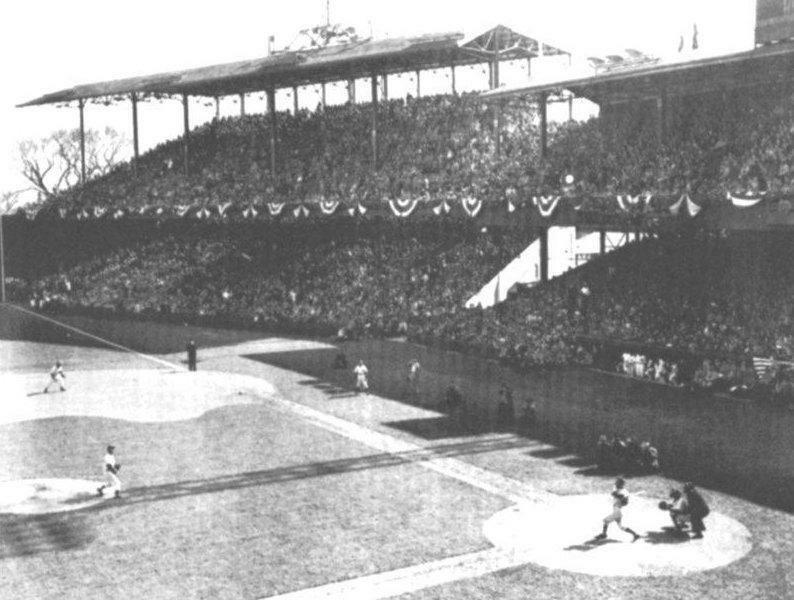 For eight seasons the Senators played at American League Baseball Park II, a small wooden 10,000 seat ballpark. 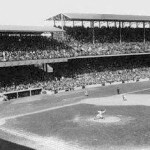 A ninth season here would have began in 1911, however, a fire ignited by a blowtorch on March 17, 1911 destroyed the ballpark. In its place a new ballpark, built of steel and concrete, was erected in just three weeks. On April 12, 1911, the new ballpark, named National Park, was partially completed as the Senators hosted the Boston Red Sox. For almost four months work continued on the ballpark when the team was out of town. It was completed on July 24, 1911 with a seating capacity of 27,410. A double decked grandstand extended from behind homeplate to the first and third bases. The lower grandstand stretched to each foul pole and bleachers stretched from left field to centerfield. Mickey Mantle’s 565 ft. homerun in 1953. 500th career win by Cy Young on July 19, 1910. Pitcher Walter Johnson compiles 243 strikeouts and 1.09 ERA in 1913. In 1920 National Park was renamed Griffith Stadium after the owner of the Senators, Clark Griffith. 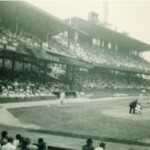 The same year, the stadium was expanded for the only time during its existence as the grandstand was double decked to both the left and right field foul poles. 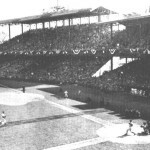 The new second deck of Griffith Stadium did not connect to the original grandstand because the original stands were graded differently. This addition increased the seating capacity to over 30,000. 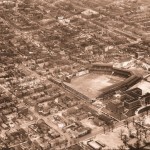 Griffith Stadium changed little throughout the rest of its life. Not only was it one of the smallest ballparks in baseball, but one of the hardest ballparks to hit a homerun at. 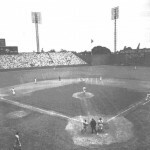 Original dimensions were 407′-L, 421′-C and 320′-R with a 30 foot high fence stretching from the right field foul pole to center field that included the scoreboard. The fence in centerfield jutted into the playing field because the team was unable to purchase five houses and a large tree when the ballpark was constructed. 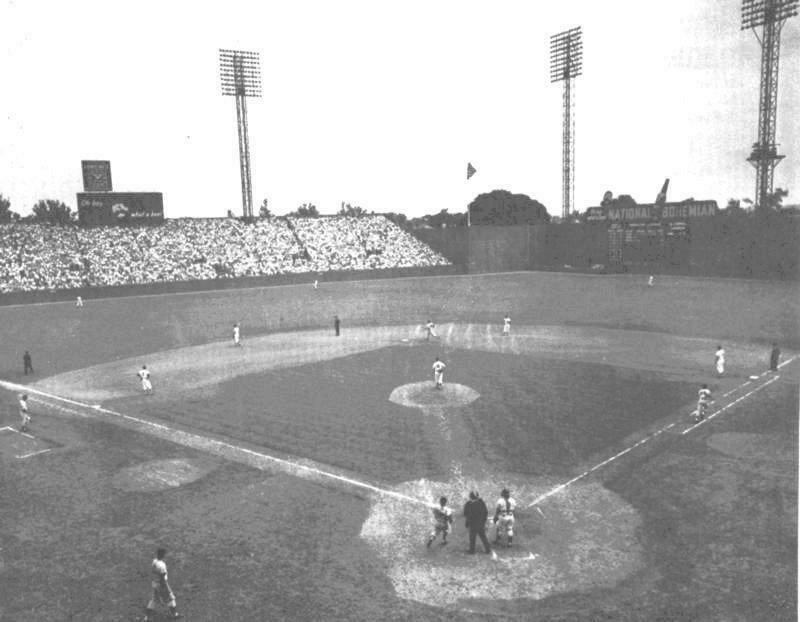 Dimensions at Griffith Stadium were shortened slightly in 1956 when a 6 foot high fence was added in front of the left field fence shortening the distance to 388 feet. The bullpens were located in right centerfield and the first night game at Griffith Stadium was on May 28, 1941. Griffith Stadium had one unique feature that no other stadium had, a Presidential box. A special luxury box was constructed next to the first base dugout for the President of the United States. Every President, starting with William Howard Taft in 1910 until John F. Kennedy in 1961 threw a ceremonial first pitch at Griffith Stadium. 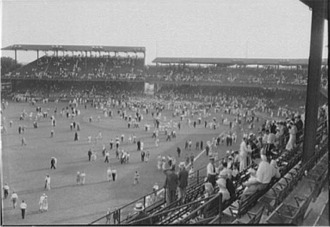 The demise of Griffith Stadium began in the 1950s. When the St. Louis Browns moved to Baltimore in 1954 part of the Senators fan base instantly became Orioles fans and stopped attending games at Griffith Stadium. A year later Clark Griffith died and his nephew/adoptive son, Calvin Griffith, became majority owner of the team. By 1958 he began looking to relocate the team to cities including Dallas, Houston, Minneapolis and Toronto. In October 1960 Griffith announced that the Senators were moving to Minneapolis’s, Metropolitan Stadium and becoming the Twins, even though a new stadium was under construction in Washington, DC. Although the Senators left after the 1960 season, Major League Baseball awarded Washington, DC an expansion franchise that began playing in 1961. The new Washington Senators played at Griffith Stadium for one season in 1961 before moving again, this time to the new D.C. Stadium. 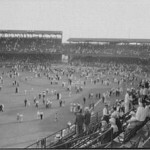 The last baseball game played at Griffith Stadium was on September 21, 1961 as 1,500 fans watched the old Senators, the Minnesota Twins, defeat the new Senators. 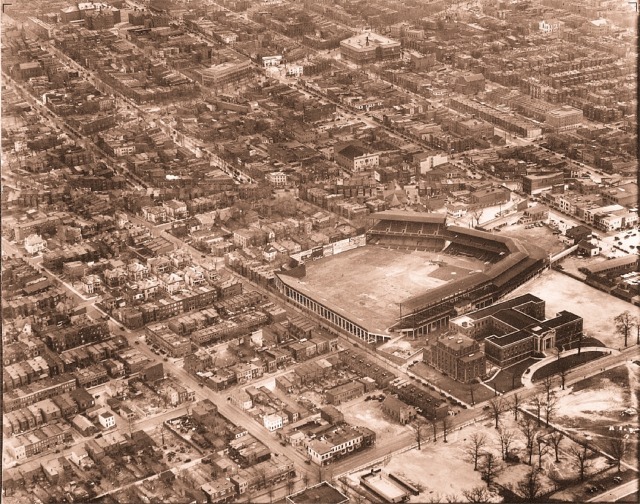 Not only was Griffith Stadium home to the Senators, but to the Washington Redskins (NFL), numerous college football games and boxing matches. 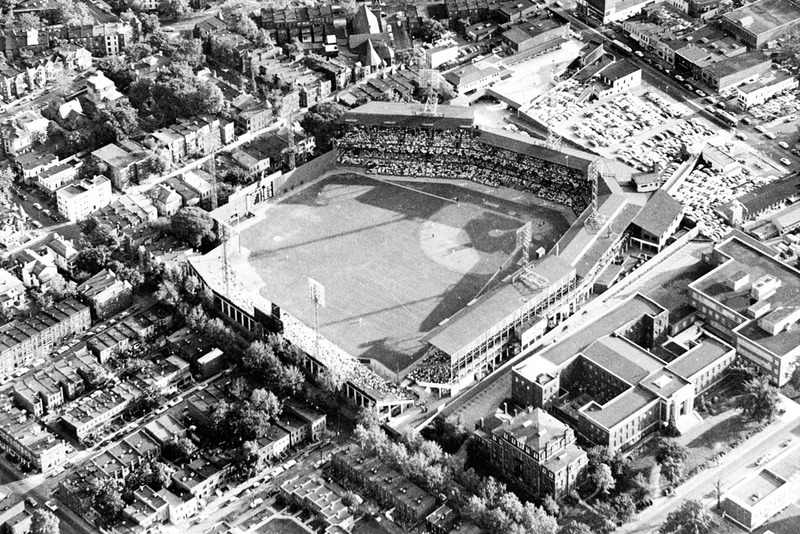 Griffith Stadium sat idle for several years before being sold to Howard University Hospital for $1.5 million. It was demolished in 1965 and the hospital now occupies the location and a plaque marks the location of homeplate. – Location: On the campus of Howard University, along Fifth and Seventh Streets.